Child Care Issues. 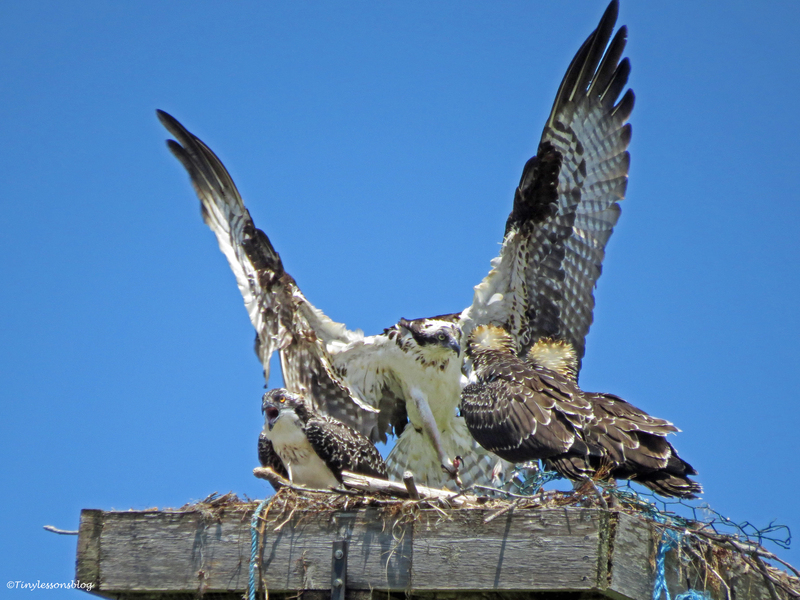 And Other Interesting Dynamics in the Osprey Family. It was almost lunch time. 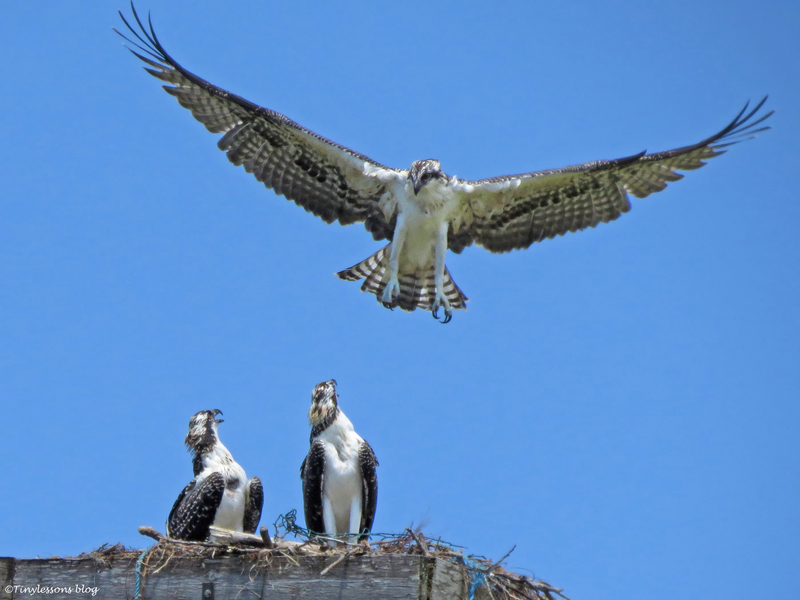 Lofty, the oldest chick, was in charge at the nest. Mama Sandy had left for a fishing trip to complement what Papa Stanley brings in. Teenagers have a bottomless appetite, as we all know. 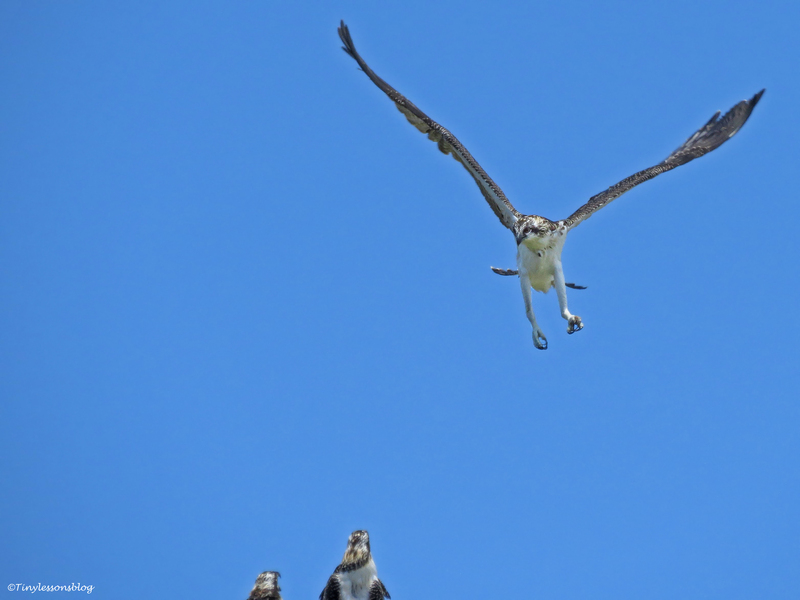 Aspire, the middle chick who fledged late last week, decided she needed another practice flight around the salt marsh. But Lofty stayed with Sindile. It was heartwarming to see how this little sister found comfort in big brother’s company. When nasty black birds flew over the nest chasing Aspire, she gradually moved closer and closer to her brother. Lofty looks after his little sister, who looks at the black birds and decides she doesn’t like them…very much. Aspire flew around for about five minutes before she got tired of being harassed and decided to return to the nest. But that was easier said than done. You see, landing seems to be the trickiest part in this whole flying business. The two newly fledged chicks tend to come in far too high. Unlike their parents who often fly just above or below the nest level and then effortlessly hop on to the edge. Just see how Aspire corrected her coordinates when approaching the nest. …I should be okay now…thanks for cheering guys. Mama Sandy arrives with fresh fish. And then they were eating in turn, from the oldest to the youngest. That brings me to this morning. I took an early walk around the salt marsh, but was not early enough to see Papa Stanley’s breakfast delivery. Since all the chicks now eat directly from the fish, Mama Sandy had left to get her own breakfast. This is how it went when they had breakfast without Sandy’s supervision – a short 1 minute clip with the inventive title – beakfast 🙂 but it takes too long to process it again. Sandy took her time. Probably eating her own fish somewhere close by. 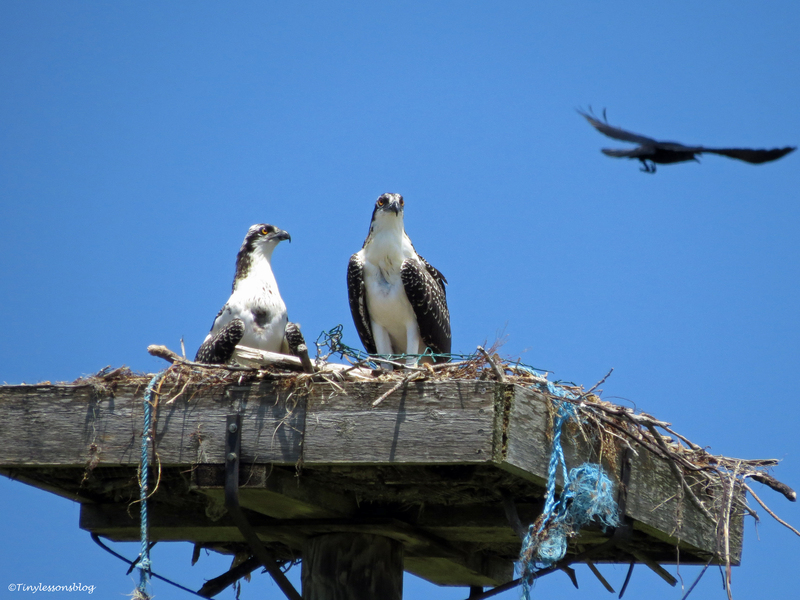 I heard some osprey communications and the chicks responded. So I walked around in the park to see if I could find her. I didn’t. But guess who I found keeping an eye on the chicks. You guessed it, Papa Stanley. He was perching on a lamp pole on the bay side. With a clear line of sight to the nest. While Sandy took a longer break, he was watching the kids so that any sudden threats could be swiftly addressed. 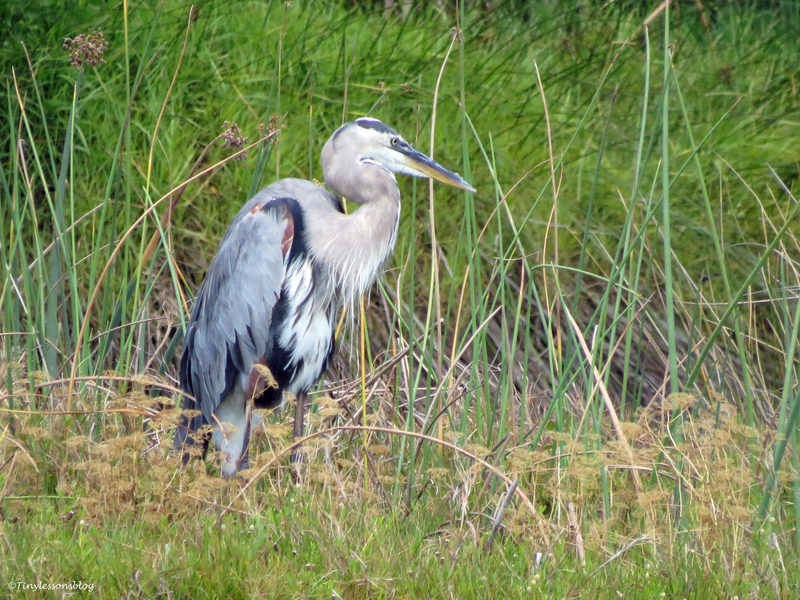 Like the possibility of a new attack by the Great Blue Heron, who returned to the marsh after a longish absence following his confrontation with Sandy. This couple never ceases to amaze me. They have it all figured out. The Great Blue Heron is back. 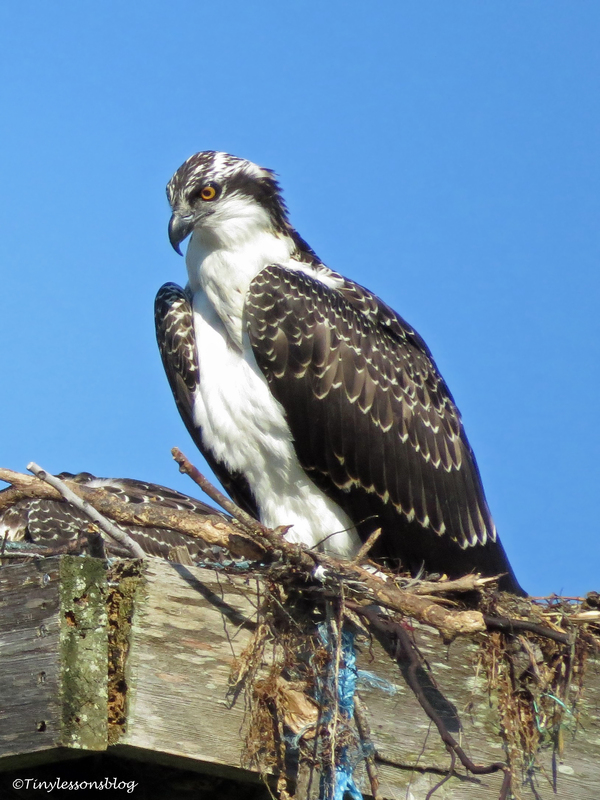 While all three chicks are still living at home, Sindile is yet to fledge. She has definitely become braver and more assertive of her rights in the nest. And I’ve seen her finally exercising her wings. Yesterday, I checked on them with my binoculars and saw Sindile was almost a foot in the air! I’m quite confident she’s going to fledge in the next few days. 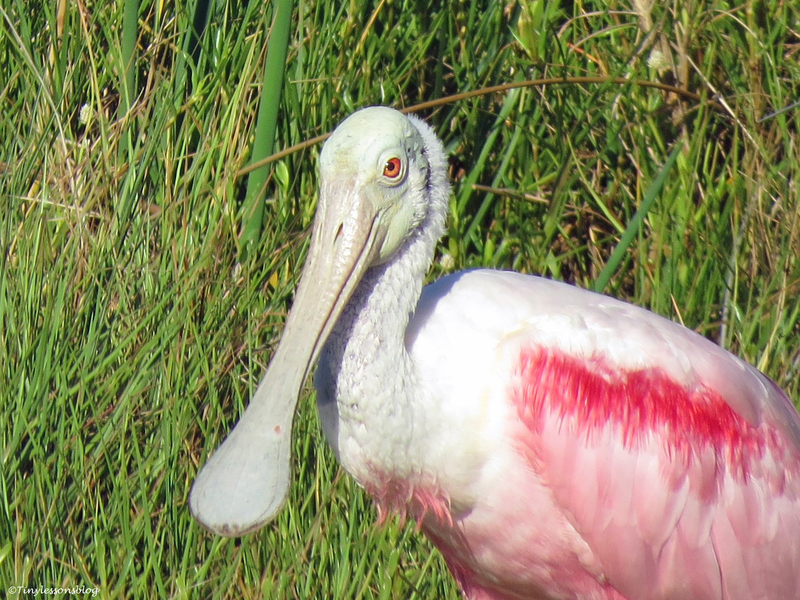 And I can’t pass on the Roseate Spoonbill. She posed for me again this morning. As in sending greetings to her faithful fans. 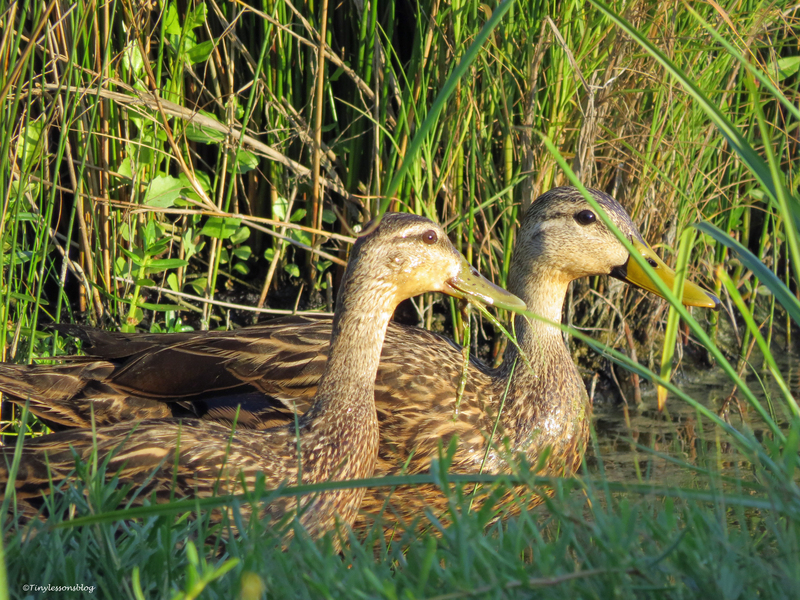 And next to her, a couple of juvenile Mottled Ducks were examining the salt marsh on their own. I’m sure they were from the brood I spotted about seven weeks ago. And now they were about 2/3 of the size of their parents. How fast they all grow up! How super that Sindile is coming into her own as her siblings leave the nest without her! Super video too – it’s great to see the action live… Have a good weekend with your kids 😀 and thanks for being so thorough with news from the Salt Marsh! I’ve always rooted for Sindile since she was born so many days after the others. I’m happy she seems to be getting “there” now 🙂 Have a great weekend too! That video clip is very very good, and the photos beautiful and sharp. 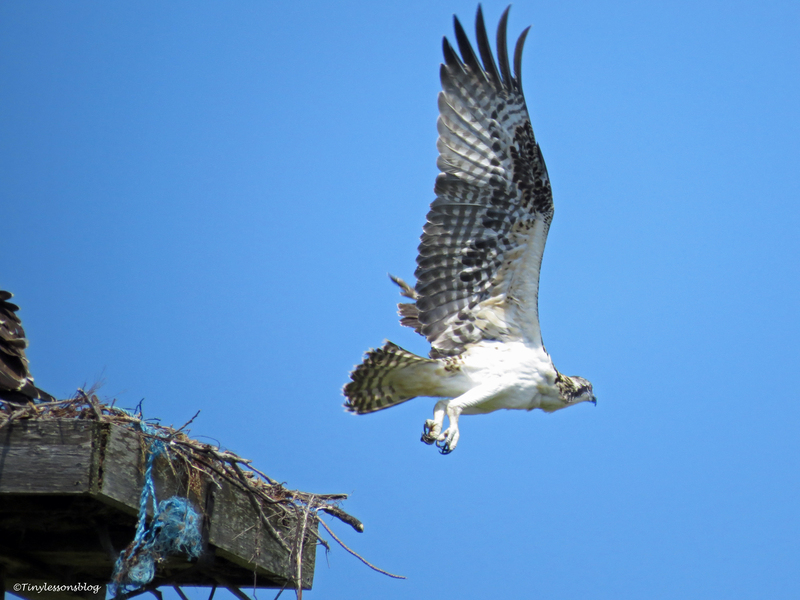 Thank you for bringing us up to date on these ospreys, and their neighbors too. Happy you liked the update, Hien. I hope my next update (which will come mid next week due to upcoming travels), will have some fledging news. Fabulous captures & narrative accompanient! Wow – they have grown so much! Love this ongoing story. They are almost the size of their parents now, beautiful young birds. I’m happy they still live at home for a little while. Echoing what’s been said already, the pictures and video were great! Definitely it looked like the one was watching you and doing that side to side head movement. What a great opportunity you’ve had to photograph these guys! I wonder when it’s time to leave the nest if Stanley & Sandy will let them stay in the area or if they’ll drive them off to somewhere else. Thanks Nancy! If what I learned last year is applicable, Sandy and Stanley will teach them to fish and then withdraw themselves from coming to the nest too much, other than dropping a fish every now and then, until the chicks one by one leave the nest when they become confident enough. 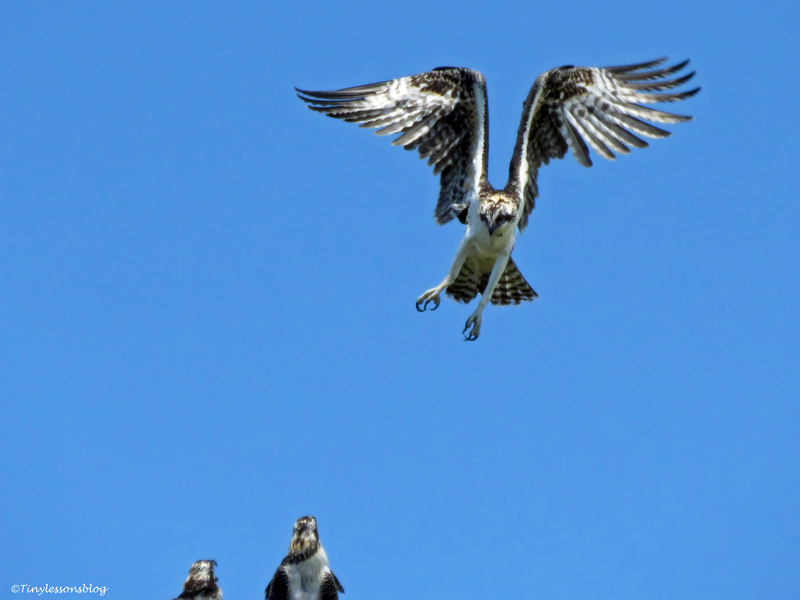 I think they fly somewhere else in Florida or a nearby state (these ospreys don’t migrate) to start their independent juvenile lives. They tend to come back when they are mature (in 2-3 years) to nest in the broad area where they were born. Last year I didn’t see the parents around for more than a month after they stopped feeding the one chick they had. Then first Sandy appeared and little later Stanley came back, and I spotted them every now and then. Love the way the siblings watch Aspire trying to land. And their table manners when Mum and Dad are away are impeccable. Perhaps they sense that Papa is keeping an eye on them so they better behave. Tiny, your card arrived yesterday. I can’t believe how quickly it came. Almost as if it had come by osprey express delivery. Lofty, Aspire and Sindile are pegged up high on a wire in my kitchen where they have a bird’s eye view of my meal preparation. Thank you to you and Bumble. What an observant photographer you are and another excellent video too, most interesting. Happy you enjoyed the update Susan. dear tiny, great update, once more! Oh, Sandy and Stanley already look exhausted…they’ve lost some weight too. Once the chicks leave the nest, they will have about six months to pamper themselves until Stanley proposes to Sandy again in early January. But they’ll need to bring fish for a few more weeks, I’m guessing until early July…Have a great weekend, Sirpa! They grow so quickly! Always a bittersweet moment, but of course I hope for the chicks to grow strong & healthy and have a good life full of adventures. Fun watching the video! The story continues to be endlessly fascinating! I love that portrait of Sindile – gorgeous! Have a wonderful weekend and enjoy your family time, such a gift! Thanks Amy! We’ll have a few more weeks before the chicks will fly out. I hope little Sindile will fledge soon, she’s now more than a week after the others. Have a wonderful weekend! 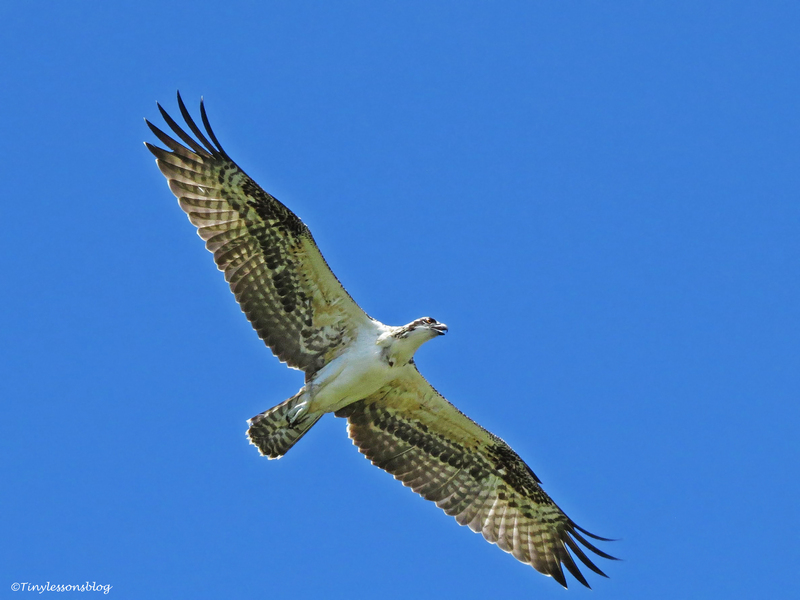 I am glad I am not an osprey ~ being able to fly would be GREAT! But eating sushi every day holds no appeal. Look at my little fighter go! She’s getting there 🙂 and what a beautiful bird she is! Happy you enjoyed the update, Sylvia. They are doing really well 🙂 Enjoy your family as well! Thank you so much for bringing their adventures to life with your insight and human wisdom! Now the Spoonbill will be happy 🙂 She is always looking at me and posing when I see her in the morning. At day time when it’s hot, she’s hiding in a bush only her tail feathers visible. Thanks for your kind comment, Jet. Tiny – such wonderful photography. Thanks for bringing these magnificent siblings into my life. Thanks Susan. They are a delight to watch…now for only a few more weeks until they fly out into the world. Thank so much for your kind comment. Although I’m writing about their lives in somewhat “light” manner, I also collect facts as I observe them. There is still so much to learn about these wonderful birds. How funny Tiny – hadn’t heard of your blog when Dogear (Nancy) included a link to it in her response to my post last week. Loved your post about the osprey learning to fly and now this one as well. 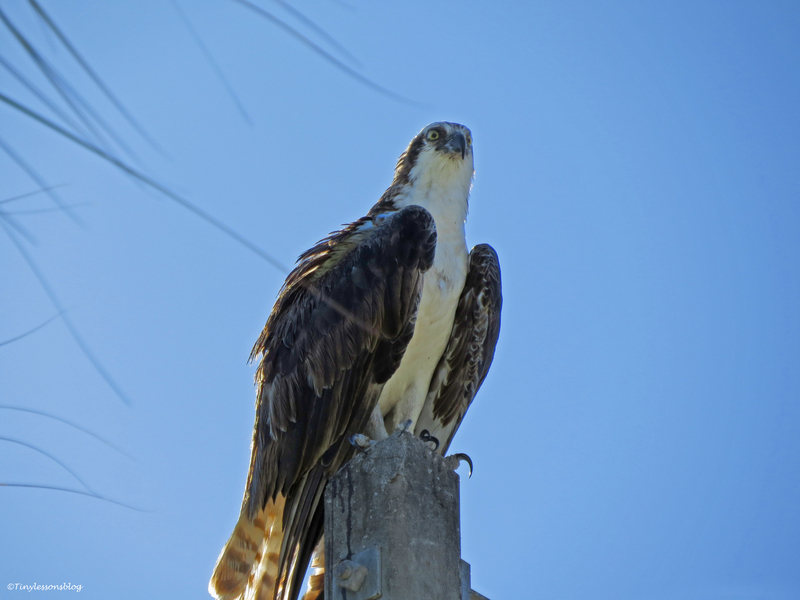 We have tons of osprey here on Kiawah. The largest nest on the island was just outside my 3rd floor window for several years but has since fallen and left vacant. Sadly although several couples inhabited it, there were never chicks. And I’d LOVE to see a spoonbill up close. Have seen 1 or 2 over the years but it’s a rare occurrence. Are you in Florida?? Hi Tina – yes, I’m on a barrier island on the Gulf Coast of central FL. Last year this same couple had one chick and this year they are three. But there were several attacks on the nest when they had eggs…I witnessed two, but these parents have been very good in defending the nest. It’s been so much fun to observe them a bit over a year now. Happy you liked their escapades, Tina.